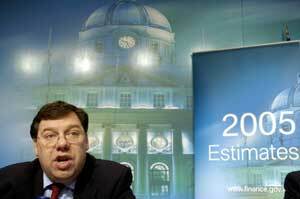 New Finance Minister Brian Cowen sped through his first Budget Estimates with clarity, but not a lot of conviction. There was clarity in that the minister was out to spend a bit more money than his predecessor, €2.5 billion to be exact, but with absolutely no conviction on two crucial fronts. The first was Cowen's claim, both at the estimates launch and later in media interviews, that there was no way that any of his announcements could be remotely construed as an election taster, as the Fianna Fáil part of the coalition government maintain their 'party of the common people' theme in the aftermath of Bertie Ahern's 'last socialist standing' interview. It fell to Sinn Fein's Finance spokesperson, Caoimhghín Ó Caoláin, to make clear that the estimates signalled the "the start of Fianna Fáil's General Election campaign". Then secondly, there was a lack of any real conviction from Cowen that this budget is the beginning of a long term change of ideology by Fianna Fáil. The hints so far in the budget estimates proposals don't show any commitment to redistributing resources or tackling inequality. They do show a commitment to more of the same policies of privatisation and dubious spending on projects without any real display of the value for money of such exercises. There were, though, some positive aspects of the estimates and these were welcomed by Ó Caoláin. He welcomed the widening of medical card cover, saying that it was "an essential measure, especially for families with children", but still fell far short of what was promised in 2002 when "they promised to extend medical cards without qualification to a further 200,000 people". 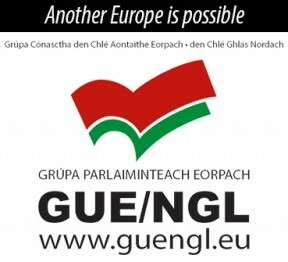 Ó Caoláin also attacked the "43% increase in the National Treatment Purchase Fund", which he said only reinforced the unequal two-tier system. The fund had yielded some short-term improvements in waiting times but it was "pouring millions of public funds into the already bloated private health business" and "in the meantime, the public system is struggling to cope due to a shortage of nurses and other staff". Ó Caoláin said Sinn Féin will continue to campaign for an end to health apartheid and for a public system with equal access for all based on need alone. Ó Caoláin was also "concerned that the allocation for Carer's Allowance has increased by just 2% and Child Benefit by 3%. These increases barely keep pace with inflation and offer little hope of the improvements necessary materialising in the Budget package on 1 December. Sinn Féin spokesperson on Justice, Equality and Human Rights, Aengus Ó Snodaigh, also welcomed some of the estimates proposed. "I see a number of things to welcome in the estimates that I have personally campaigned for over the past two years," he said. These included spending increases on Legal Aid, which had been "strangled by this Government", and the Probation and Welfare Service, "long starved of resources". "I particularly welcome the 40% increase in the programmes to combat Violence Against Women, which is an issue area that has never received sufficient attention from any government" said Ó Snodaigh. "However, there are still some disturbing problem areas that show a lack of vision and real commitment to an equal society. The chronically underfunded Human Rights Commission, a core element of the Good Friday Agreement, and the IMC, an element that is totally outside the Agreement, receive almost the same level of funding. "The Peace Programme is being cut by 50% this year. There is still no adequate funding for TG4. The National Action Plan on Racism appears to have been completely defunded. There will be no increase for crime prevention measures and a cut for prisoner education and training programmes".